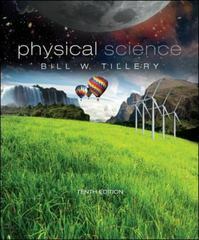 Physical Science 10 Edition Physical Science, Tenth Edition, is intended to serve the needs of non-science majors who are required to complete one or more physical science courses. It offers exceptional, straight-forward writing, complemented with useful pedagogical tools.Physical Science introduces basic concepts and key ideas while providing opportunities for students to learn reasoning skills and a new way of thinking about their environment. No prior work in science is assumed. The text offers students complete coverage of the physical sciences with a level of explanation and detail appropriate for all students.The sequence of chapters in Physical Science is flexible, and the instructor can determine topic sequence and depth of coverage as needed. The materials are also designed to support a conceptual approach, or a combined conceptual and problem-solving approach. Along with the accompanying laboratory manual, the text contains enough material for the instructor to select a sequence for a two-semester course.